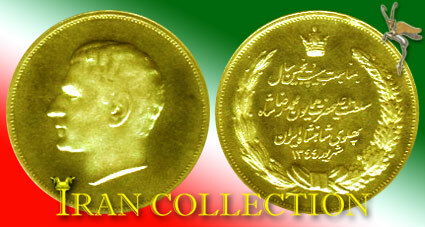 Commemorative gold coin of the 25th anniversary of the reign of Shah Mohammad Reza Pahlavi, 1965. Obverse: (Right), Wreath of laurel and the Pahlavi crown at the top. Persian script: " Be monaasebat-e bisto panjomin saal-e saltanat-e alaahazrat homaayoun Mohammad Reza Shah Pahlavi Aryamehr Shaahanshaah-e Iran , Shahrivar-e 1344" (In honor of the 25th anniversary of the reign of H.I.M. Shah Mohammad Reza Pahlavi, Aryamehr, the king of kings of Iran, Sept. 1965). Reverse: (Left), Profile of Shah Mohammad Reza Pahlavi. This coin is minted in 3 different types: Gold, Silver and bronze.